Crooked-lipped, catty Hermann Goering, No. 2 NAZI, talked freely of Hitler's orders to do away with him. As noteworthy as the Division's battle feats over a period of twenty months was the magnitude of the enemy leaders it captured during the last few days of the war. Three of these captives, Reichsmarshal Hermann Goering, Field Marshal Gerd von Rundstedt, and Dr. Hans Frank, were later destined to face war criminal charges at the combined Allied trial at Nurnberg. Germany's Luftwaffe Chief and No. 2 Nazi, Hermann Goering, surrendered to the Assistant Division Commander, Brig. Gen. Robert I. Stack, on V-E Day, following negotiations by his personal adjutant, Col. Von Brauchitsch, son of the German field marshal. Von Brauchitsch arrived at the Division CP early in the morning of May 7 with a message to Gen. Eisenhower and Gen. Devers, Commanding Sixth Army Group. He explained his mission to Gen. Dahlquist and Gen. Stack, offering to send his driver with the latter to Goering's secret hideaway. Gen. Stack accompanied the driver and intercepted the pompous Goering on a road near Radstadt, about 35 miles southeast of Salzburg. The marshal understood some English, spoke very little. He was accompanied in his Mercedes Benz by his Frau Emmy, daughter Edda, several military aides and personal retainers. Because of the darkness and the presence of SS troops in the area, it would have been dangerous to have returned to the Division that night, so the entire party went with General Stack to a nearby castle which had been occupied by elements of the Florian Geyer S. S. Cavalry Division. The capture of this castle had been accomplished by General Stack and a platoon from the 636th Tank Destroyer Reconnaissance Company and the I & R Platoon of the 142nd Infantry earlier in the day. In the morning the German leader was taken to the 36th Division CP in Kitzbuhl's swanky Grand Hotel. 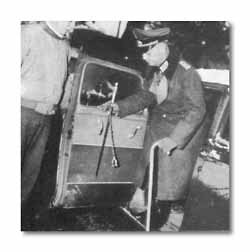 There Gen. Dahlquist questioned him, particularly for Heinrich Himmler's whereabouts. 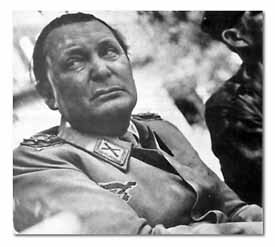 Goering talked freely but gave no specific tactical information. He explained in detail his quarrel with Hitler on April 23 when he had called the fuhrer in Berlin. As soon as the interrogation was over he was placed in a cub plane and delivered to the Chief of Staff, Seventh Army. 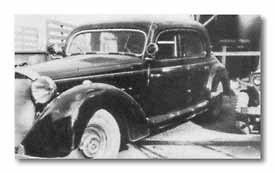 Goering's car, a high-powered, new Mercedes-Benz, featured six-ply glass two inches thick. Field Marshall Gerd von Rundstedt, brilliant Prussian military strategist, and acknowledged dean of Junker generals, surrendered to 2nd Lt. Joseph E. Burke and a ten man patrol from Company A, 141st Infantry, on May 1, during the battle for Bad Tolz. A prisoner taken by the 1st Battalion, 141st Infantry, first revealed that Von Rundstedt was in the area. When further questioned, he told of the house in which the marshal's party was quartered. As Lt. Burke entered the hospital residence, Von Rundstedt, his wife and son, jumped up from their seats before the fire. Said the field marshal, "It is a most disgraceful situation for a soldier to give himself up without offering resistance." The son, Lt. Hans Gerd von Rundstedt, stated that his father had last seen Hitler on March 12 when he had been relieved of his command of all German armies on the Western Front. The aging Rundstedt had been taking a bath cure at Bad Tolz in an effort to heal a leg ailment. Despite a noticeable limp he retained the traditional Junker austerity. Von Rundstedt bore his self-termed disgrace--that of a soldier giving up without resistance. 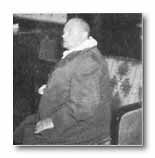 The third of the Nurnberg defendants was the infamous Reichsminister Dr. Hans Frank, Gauleiter of Poland and perpetrator of Jewish extermination pits. Frank was trapped in his office by Maj. Phillip Broadhead of the Division AMG team. Admiral Nicholas Horthy, the Hungarian regent who consorted with Adolph Hitler, and who is credited with establishing one of Europe's first dictatorships, was found by an advance headquarters detachment led by Maj. Arnim F. Puck in the palatial Schloss Waldbichl near Wielheim. Max Amann, stodgy Nazi publicist, and the third man to join the National Socialist Party, was seized by security troops of the 141st Infantry on a SHAEF warrant, charging him with war crimes. Amann had been living in seclusion at his summer home near Tegernsee. The 36th Division bag included 22 other influential Nazi commanders. They were: Air Marshals Ritter von Greim, who succeeded Goering in command of the Luftwaffe, and who committed suicide in captivity; Hugo SperrIe, who invented dive-bombing tactics, planned the London blitz, and defended the Normandy coastline in 1944; SS General Sepp Dietrich, the defender of Vienna against the Russians, and one of Von Rundstedt's cruel fledglings in the Ardennes; and 19 lesser generals.